In the ancient and dazzlingly scenic cave city of Cappadocia, Mr. Aydin runs a hotel, writes a smalltime column called 'Voices of the Steppe,' and serves as landlord for pretty much the entire nearby population though he is so hands-off that even he admits he wouldn't necessarily recognize their faces if he passed them on the street. A former actor, he's also intermittently researching a history of Turkish theater. But mostly he talks... and talks... and talks. He talks with his groundskeeper/chauffeur, his dissatisfied and much-younger wife, his bitter stifled sister, his few and far between guests (offseason is descending) and, when he can't self-servingly avoid them, his hard-pressed poverty-mired locals. One of these latter is Ismail, a hot-tempered heavy-drinking man who served time for a fight that got out of hand and has had trouble finding employment since. After failing to make rent, his TV and refrigerator are repossessed in front of his family, shaming him. The incident takes place offscreen before the movie opens. Our story begins when his son, Ilyas, throws a rock at Mr. Aydin's car. Over the past decade the internet has been having some really great discussions on privilege, discourse and authority; the contemporary first-world expressions of power hierarchies and class structures which are perhaps more subtle than in the past but no less pervasive and powerful. These discussions rarely ever make it to the big screen and rarer still in forms that capture the incredible complexity and breadth of perspectives that make them meaningful. 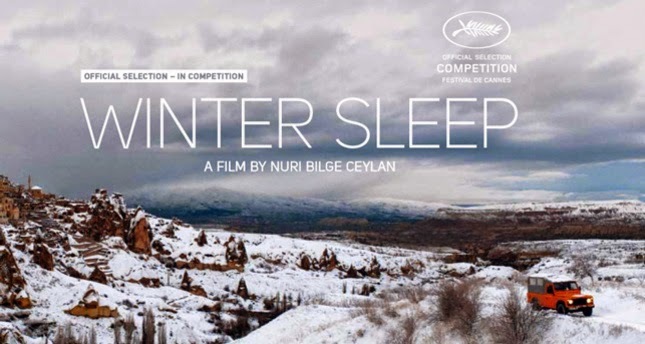 But if any of those topics are of interest to you, then Winter Sleep is a movie you will want to see. And if they aren't of interest to you, then Winter Sleep is probably a film you should see. But I hate it when critics tell me I 'should' see a film, so instead I'll talk about why I'm glad I did see it. It woke me up a little. At times I was Mr. Aydin, or recognized him, loathed him or sympathized with him, found him impenetrable or saw right through him and through myself. Mr. Aydin is a fantastic character, and his every interaction with the people around him are mini-masterpieces of mutual, conflicting and self deceptions. It's almost worse when he hits upon truth. His erudition has brought him little personal insight and less redemption, but it has brought him eloquence and armed him to the teeth with rationalizations for his ideas and his way of life. He's not quite unaware, and certainly not blissfully unaware, of his pettiness, vanity, cowardice and mediocrity, but he has largely accepted these faults, excused them and taught himself not to dwell on them. Instead he dwells on the faults of others (when he isn't completely consumed with his incredibly niche hobbies) and seems to think that if there are things wrong with the people he is arguing with, then he himself must be right. This film is 196-minutes and slow. But it is by Nuri Bilge Ceylan, which for me has come to mean that it is worth the time and effort no questions asked. I won't even go into the cinematography except to say that it is every bit as good as the writing. I'd rank this ever so slightly below Ceylan's Three Monkeys, but it is surely his most penetrating and ambitious in a brilliant oeuvre that continues to mature and impress. Hi there, I am wondering if you know which scene the second photo (the two characters facing the fireplace) is from? I have skipped through the entire film and cannot seem to find it. Thanks! Nope, sorry! I caught Winters Sleep at a film festival, so to get the screenshots I had to use a trailer on youtube.